The Fisher Scientific Isotemp Chromatography Refrigerator provides the superior stability and dependability you’ve come to expect from Thermo Fisher products. This double door lab refrigerator is constructed of high grade epoxy coated steel, with energy efficient, double paned glass doors, filled with inert argon gas to retain temperatures while providing easy viewing of progression. The brightly lit interior of the Fisher Isotemp Chromatography Refrigerator is painted white for great contrast and features a duplex outlet,with two 2inch access ports for instruments on either side. The temperature range of this chromatography refrigerator is between 1-12°C with a stability of ±3°C. The Fisher Isotemp Chromatography Refrigerator has added security for your samples with a variety of alerts and preventative measures. 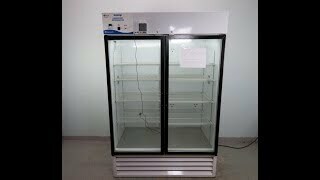 High and low temperature set points for this lab refrigerator can be programmed and locked for added security. Operations for this chromatography refrigerator are microprocessor controlled on the bright digital display and allow users to choose their temperature set points, as well as silence the audible and visual alarms. This Fisher Isotemp Chromatography Refrigerator has been tested for functionality and comes with current validation reports. All of our lab equipment comes backed with our standard warranty. Should you have any questions, please don't hesitate to contact us.